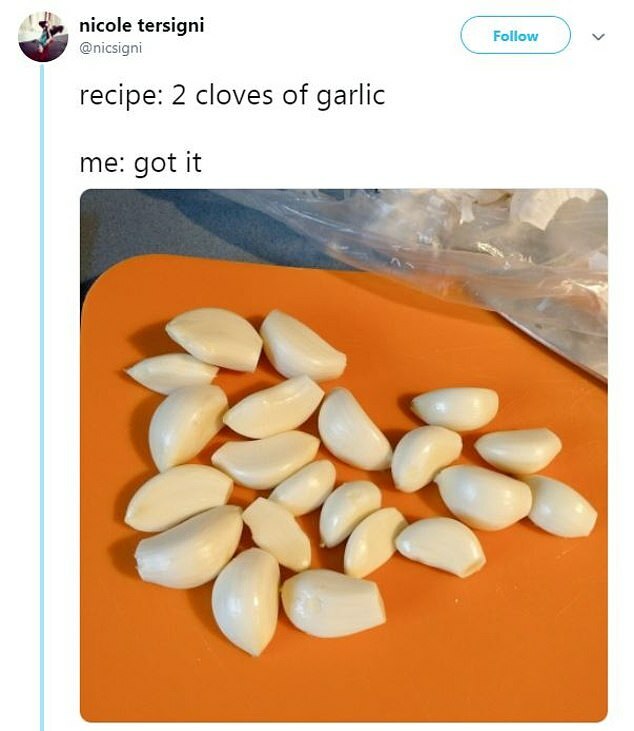 Twitter user @nicsigni tweeted a photo of the amount of garlic she intended to use for a dish that required two cloves of garlic. And the tweet seemed to resonate with a huge number of people, as Nicole received almost 1,500 comments, 127,000 likes and a total of 33,000 retweets from fellow garlic lovers around the world. It’s no secret that garlic is one of life’s great additions to most dishes. 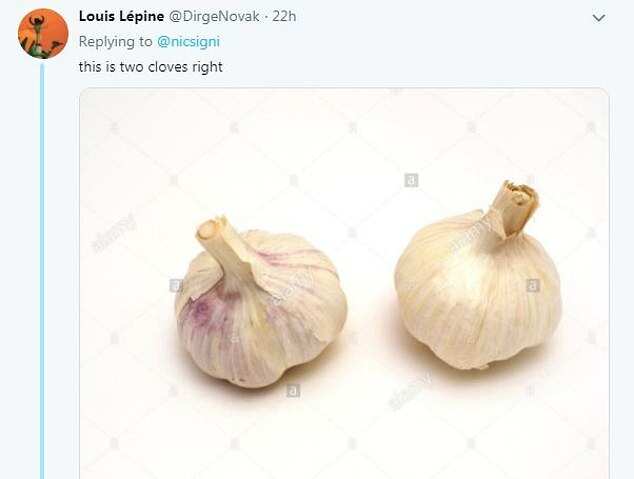 However Nicole Tersigni, who shared a photo of more than 20 garlic cloves on a chopping board as she prepared to cook a meal, probably wasn’t expecting so many other to agree with her garlic to everything else ratio. After sharing her photo online, Nicole received an abundance of comments from fellow lovers of the tasty herb. ‘I very much love this tweet and garlic,’ added user @GBradmann. Some Twitter users began sharing stories of some of their best and worst garlic experiences. ‘First time I made bruschetta as a kid I thought a clove of garlic was the whole bulb.. 3 cloves of garlic with that understanding was potent,’ wrote @KnightOtheRound. And user @Hypersmurf wrote: ‘We had some friends whose family recipe for tomato sauce had been handed down from their grandmother. ‘The recipe SHE initially followed called for ‘2 fists of chilies’. She figured “I have small fists”, and used 6 fists of chilies instead. And that became the new recipe’. Some garlic-enthusiasts even began sharing tips and tricks. ‘I peel several bulbs at once, put in my food processor and freeze it spread out flat, then break it up so I can easily toss it into whatever. Jarred stuff isn’t the same at all,’ wrote user @SmrtCanuck. Twitter user @Lusewing said: ‘And it is not just the bulbs you have to love, garlic flowers are wonderful when added to soup and the leaves are great chopped into salad. After seeing the massive reaction to her original post, Nicole tweeted saying that she has ‘found her people’. She wrote: ‘My new followers are going to be so disappointed when I never tweet about garlic again. 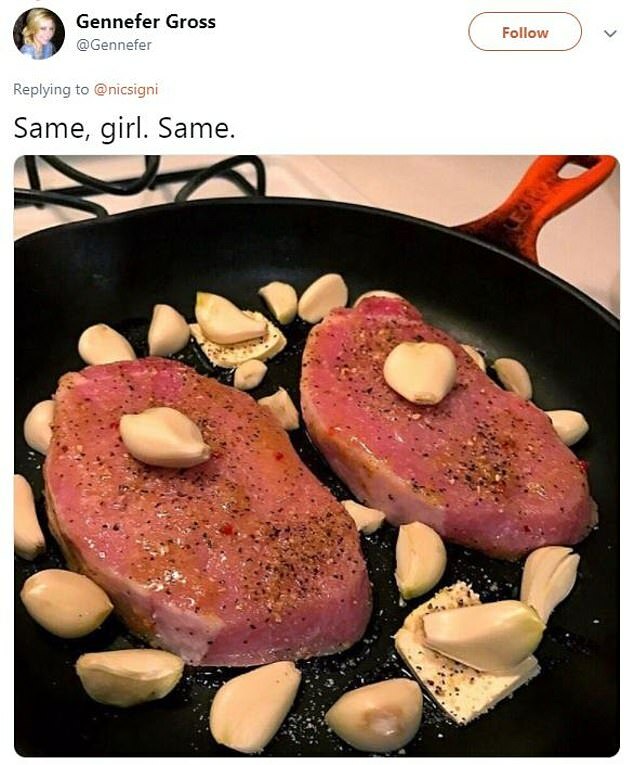 Obviously not expecting to ever gather so much attention on the post, Nicole wrote: ‘I cannot possibly keep up with this but I’m so glad we can all come together and agree garlic is life. ‘Now excuse me while I go make out with my husband,’ she added.